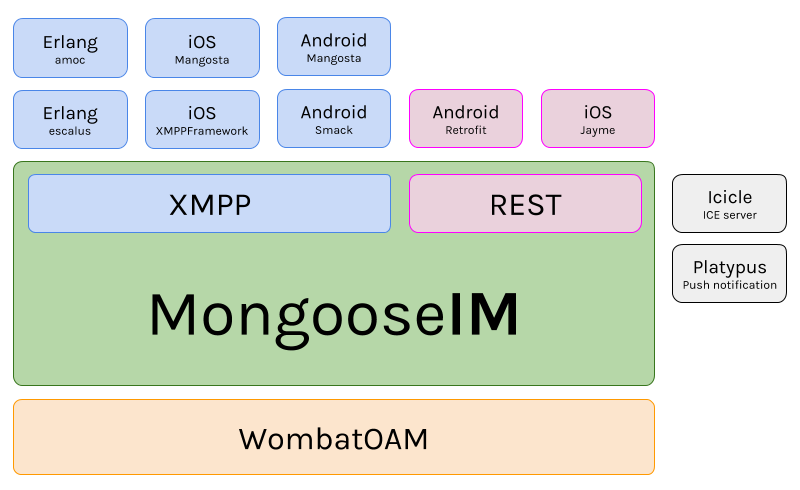 MongooseIM is robust and efficient XMPP platform aimed at large installations. Specifically designed for enterprise purposes, it is fault-tolerant, can utilize resources of multiple clustered machines and easily scale in need of more capacity (by just adding a box/VM). MongooseIM can accept client sessions over vanilla XMPP, Websockets, HTTP long-polling (a.k.a. BOSH), and a REST API. The MongooseIM platform comes with server-side components and client libraries. We provide a test suite and a monitoring server. We recommand third-party, open source client libraries for XMPP and REST API. It is brought to you by Erlang Solutions and Inaka. When developing new features/modules, please take care to add basic documentation to the doc/ directory, and add a link to your document in doc/README.md.